I have this myself i must say its a brilliant charger, loads better than the branded samsung one, you only need look at the reviews for it. 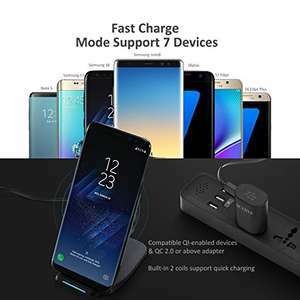 Continuous and stable charging current, will not damage your battery; Keep your mobile phone away from the damage of poor quality wireless charger.Designed-in curved bottom, provides good stability for some curved phones and decreases the chance of dropping. Also, built-in over-voltage, under voltage, and short-circuit protection provides ultimate safety for your smartphone. Say goodbye to tangled wires and lost charging cables. The PrimAcc Wireless Charging Stand utilizes Qi Inductive Charging Technology that eliminates the need to fumble with charging cables each time you want to charge your device. Perfect for at home or the office, the dedicated charging stand is always at the ready, providing wireless power whenever you set your device on the stand. The stand was designed to allow you to still use your device while charging, propping it up so you can navigate music, review notifications and answer calls without having to interrupt charging. 1.Fast charge modes are ONLY available for the 7 models Samsung Note 8 / S8 / S8+ /S7 /S7 Edge /S6 Edge Plus/Note 5, and will standard charge the Qi-enabled devices at a regular speed like iPhone X, iPhone 8/8 Plus,Samsung S6,S6 Edge. 2.Because S8 products' self-protection, sometimes you can only charge your phone to 70%--80%. Take it off for a while, and put it back on again, then it'll charge the remaining amount. Will this work in iPhone 8 Plus? seems the lightning deal is sold out back upto £18.99 now which is still a bargain. 【Universal Compatibility】Two models for wireless charging: (1)Fast Charge Model ONLY available for Samsung Galaxy Note8, S8, S8+, S7, S7 Edge, S6 Edge Plus, Note 5. (2)Standard Charge Model for other standard QI enabled device like Apple iPhone X, iPhone 8/8 Plus, Samsung S6,S6 Edge. seems the lightning deal is sold out back upto £18.99 now which is still a …seems the lightning deal is sold out back upto £18.99 now which is still a bargain. You mean "Shame iphone 7 doesn't work with it"
anyone knows if the light that turns on while charging can be switched off? Rmemeber when wireless charging was all the rage 6-7 years ago then everyone forgot about it? Have to factor in cost for fast charging USB plug. I have an iphone 6S, think I will get this as it looks really cool! Another stupid question here but can it charge with a case on the phone or do you need to keep taking the case off? Oh wait- I think I read the description wrong, 'standard charge the Qi-enabled devices at a regular speed like iPhone X, iPhone 8/8 Plus,Samsung S6,S6 Edge'. I read that as iphone 6 and not Samsung 6!! Doh, woops!! If it supports wireless I don’t see why not?